A recent shift in interest from starch-based ethanol to cellulosic ethanol has helped spur growth in the biofuel enzyme market. Indeed, researchers have produced low-cost cellulosic ethanol using techniques that have significantly lowered the cost of biofuel production, which has boosted market growth. The need for alternative energy sources other than traditional fossil fuel is increasing as global energy consumption continues to spike. Various types of feedstock are being considered for producing alternative fuel, in which biofuel enzymes -- amylase, cellulose, xylanase, lipase, protease, lysomax, and FermaSure -- play a vital role. Biofuel, as one of the best alternatives to fossil fuel, is biodegradable, non-toxic, and produces few emissions. Biofuels produced by enzymes can be used in various industries, including, significantly, transportation. Research is continuing to investigate the production of more efficient biofuels that can be cheaper than fossil fuel and may reduce the risk of engine damage. In many parts of the U.S. and Europe, biogas and bioethanol find applications in power generation, with cellulase and xylanase enzymes the main ones used for this purpose. The agricultural and irrigation sectors have many biofuel-powered equipment, which mainly run on biodiesel. The domestic sector in some countries uses ethanol and biogas for cooking and heating purposes. In addition, biofuel produced through enzymes is used by many other industries and organizations such as chemical, automobile, aviation, marine, research etc. According to BCC Research's Global Markets and Technologies for Biofuel Enzymes (EGY099B), the global market for biofuel enzymes is projected to reach $652.1 million and $1.1 billion in 2015 and 2020, respectively, reflecting a healthy five-year compound annual growth rate (CAGR) of 10.4%. The U.S., the region with the highest five-year CAGR at 11.3%, should reach $355.7 million by 2020. The emerging market region, chiefly represented by Brazil, China, India, Thailand, Japan, Australia and South Africa, is projected as the largest segment with revenues totaling $389.7 million through 2020. The U.S. trails the emerging market countries but is ahead of European countries due to the presence of novel enzymes and techniques as well as government aid and support. The European region is also growing due to a biofuel mandate by the E.U. and the launch of products and plants. A key driver of the biofuels market is the increased production of cellulosic ethanol. This, along with second-generation feedstock, has made it easier to produce cellulosic ethanol and other varieties of enzymes. "As starch-based ethanol comes under first generation feedstock, the production in recent years has shifted to cellulosic ethanol, which uses second-generation feedstock as raw matter," says BCC Research analyst Shalini Dewan. "Cellulosic ethanol can now be produced easily with the help of novel enzymes, an enzyme cocktail and pretreatment process. For example, Codexis Inc.'s launch of novel enzymes, as well as the use of enzyme cocktail mix for lignocellulosic matter, has helped to make second generation biofuel a reality and cellulosic ethanol production cost effective." Various types of enzymes have been used in different steps for the production of biofuel from biomass feedstock. Amylase enzymes are used in starch-based ethanol production. As starch-based ethanol comes under first generation feedstock, the production in recent years has shifted to cellulosic ethanol, which uses second generation feedstock as raw matter. For cellulosic ethanol production, cellulase and xylanase have been used. Similarly, lipase enzymes are used in the production of biodiesel, while cellulase, amylase, and xylanase find applications in biogas production. Other enzymes like protease and lysomax are used for various processes such as distillation, hydrolysis, and oil degumming during biofuel production. Biofuel enzyme production has increased along with biofuel growth. Innovative, dynamic, highly potent, cost-effective and thermostable enzymes have been discovered and produced commercially. Along with this, several processes have been introduced for the ease in obtaining biofuel from its raw matter, e.g. Genencor’s Accelerase Trio for producing low-cost cellulosic ethanol, which was launched in June 2011. DuPont acquired Genencor in that year. In 2013, Verenium Corp. (San Diego, Calif.) launched several enzymes used in the production of bioethanol. Deltazyme APS (protease) and Xylathin were launched in May 2013, while Pyrolase HT cellulase — which is being used in oilfield services -- hit the market in February 2013. In December 2014, Novozyme launched Eversa for the production of biodiesel. In June 2013, Novozyme introduced Spirizyme Achieve to market along with Novozyme Olexa (an enzyme that works by freeing up oil bound in the corn germ). Novozyme Avantec was introduced to the market on October 2012. Used together, the three enzymes (i.e., Spirizyme Achieve, Olexa and Avantec) can increase bioethanol yield from corn by up to 5% and corn oil extraction by 13%, while saving 8% energy. 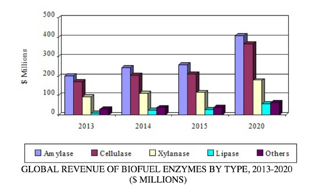 For global biofuel enzymes market by types, amylase had revenue of $201.1 million in 2013 and rose to $244.6 million in 2014. Demand of fuel ethanol is the main driver of amylase growth. The amylase market is expected to increase at 9.4% CAGR and reach revenue of $408.3 million by 2020. Cellulase market revenue totaled $169.1 million in 2013 and increase to $205.3 million in 2014. This market has shown healthy growth in the past few years, due to the use of advance enzymes and preprocessing technology. The market is projected to reach a value of $365.6 million with a CAGR rise of 11.5% by 2020. Xylanase had sales of $92.3 million in 2013, which rose to $110.9 million in 2014. Xylanase demand is growing along with increased cellulosic ethanol consumption. The xylanase market is expected to hit revenues of $177.2 million by 2020 with CAGR of 9.1% in the five-year period (2015 to 2020). Market revenue for lipase was $7.9 million in 2013 and it increased to $26.4 million in 2015. Lipase market is growing rapidly in Europe as biodiesel is the major alternative fuel used in that region. With a significant CAGR of 16.2%, the lipase market is expected to reach $56 million by 2020. Revenue for the Others enzyme category (protease, acyl transferase etc.) was $30.3 million in 2013. This market depends on the biofuel market. For the production of cellulosic ethanol and biodiesel, Other enzymes like FermaSure and protease have been used. Thus, biofuel market growth directly influences the growth of enzymes in this category. It is projected that the market for other enzymes will grow at a steady CAGR of 10.6% and reach $63.5 million by 2020.